The diamond you choose will be symbolic of the love you share with your partner for the rest of your lives, and you want it to be as special as your love for each other. While a diamond is all about romance and falling in love with the stone you buy, you should know some facts about what you are investing in. For that reason, buying your diamond from an experienced, reputable expert who can guide you along the journey and answer any questions you have will make all the difference. Picking the diamond that’s perfect for you begins with having an idea of the style and look of the ring you want; as well as how much money you’d like to spend. The most important thing to remember is you should buy a stone which is both the right size and the most beautiful for your budget. And that’s when some diamond education comes in. So, take the time to do some research first. What people don’t often know is it’s the cut of a diamond that is the biggest determiner of its beauty. Diamonds should sparkle and shine! And the better the cut, the prettier the brilliance of the diamond. 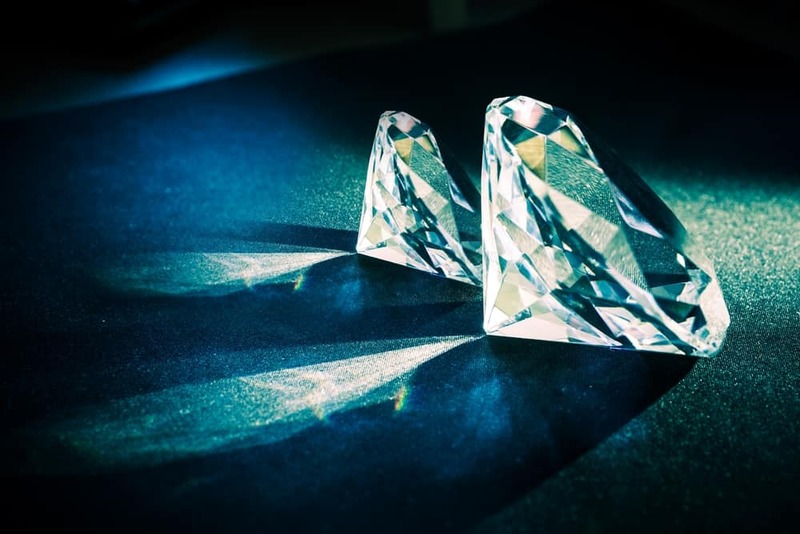 A diamond should not be cut too deep or too shallow – it needs to be proportionally right to let the perfect amount of light through to let the stone sparkle. Second to the cut of a diamond is its colour (or lack of). Usually, the less colour the diamond has, the higher its grade. The clarity of a diamond determines the purity of a stone. Most diamonds have tiny imperfections called inclusions (link to glossary), and the fewer and less visible they are, the higher the clarity grade of a stone. Many people believe the term carat refers to size, but in fact it actually refers to the total weight of a diamond. Once you have the ‘Four Cs’ under your belt and a basic understanding of picking and buying a diamond, you need advice from a credible expert who can start to narrow the field for you, clear up the questions you’ll have from your research and help you choose the perfect stone. Then it’s all about looking at diamonds and getting a feel for what your budget will buy. Look at cut and what it means to the sparkle of a diamond. Have your expert show you stones of different clarity, carat size and colour and how each aspect affects the stones. Be sure to work with a jeweller with training from a highly-recognised and internationally accredited program who can explain the Four Cs to you and demonstrate the differences between stones which may look very similar to the untrained eye. At Whitakers, we know how important picking the perfect diamond is – and what it represents in your life. It’s our role to help you in your search for the perfect diamond ring. Our staff are professionally-trained experts who can answer all your questions and help you compare diamonds that fall within your budget and then make an educated decision about picking the perfect one for you. Why not come in to our Newcastle boutique store and we can help you select the perfect diamond?